How Much Did Wednesday’s Debate Help Romney? Did Obama’s poor debate performance cause his poll standing to crater? There’s good reason to doubt this. Obama’s drop has been large enough that, almost literally, the debate could have been the cause only if every single undecided voter watching on Wednesday had decided overnight to vote for Romney. Historically, there’s simply no precedent for this. Presidential debates typically have only a modest impact on campaigns, and it’s not as if Obama staggered onto the stage shitfaced or something. But if you’re not convinced, take a look instead at the Pollster poll average below. I’ve labeled it for easy reference. 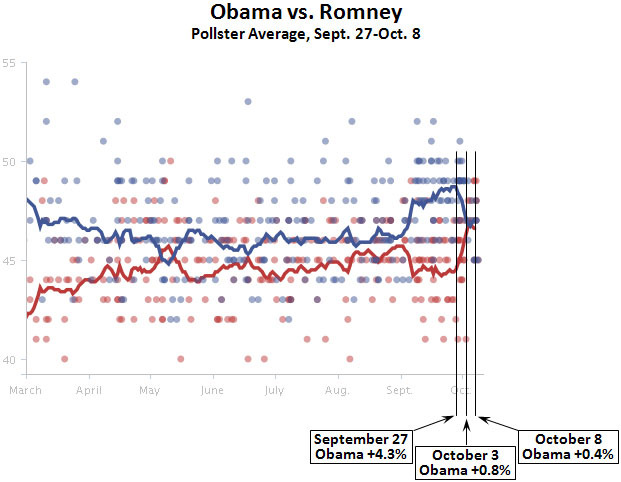 Between September 27 and October 3 — before the debate had an impact — Romney gained 3.5 points on Obama. Between October 3 and October 8 he gained another 0.4 points. In other words, nearly all of his gain came before the debate, not after. Other poll averages I’ve looked at show different trajectories. RCP shows Romney gaining ground starting at the end of September, but (unlike Pollster) shows that he gained more ground after the debate than before. Nate Silver shows all of Romney’s gain coming after the debate, but his model also shows a fairly smallish gain. There’s no unqualified answer here. Still, the balance of the evidence suggests that Romney was bouncing back from his terrible September well before last Wednesday, and has gained modestly but not titanically since then. There’s obviously been some mean reversion to the fundamentals here, and it’s not yet clear just how big an impact the debate has really had. We’ll know more over the next few days.